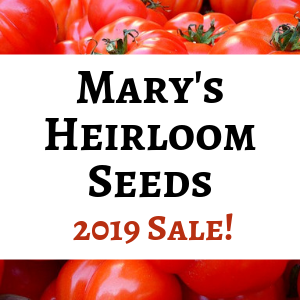 Ben Franklin said, “A penny saved is a penny earned.” Adjusted for inflation we might say that a hundred dollars saved is a hundred dollars earned. Actually it’s more than that; when you earn $100 you pay income tax on it, but when you save $100 you keep the whole Benjamin! The average American household spends almost $2000 per year on heating and electricity. Nearly 60% of the energy we buy is wasted due to inefficiency. That means that we’re spending $2000 but only receiving $800 worth of usable energy. Nothing is 100% efficient but some items are worse than others, so let’s look at minimizing your home’s inefficiencies in order to save a few Benjamins. Since this is a pretty large topic, I’ll present it in two separate articles: one for lighting, electronics, and appliances and a second for heating and cooling. The US Department of Energy runs the Energy Star program, which evaluates products to ensure that they meet certain efficiency standards. 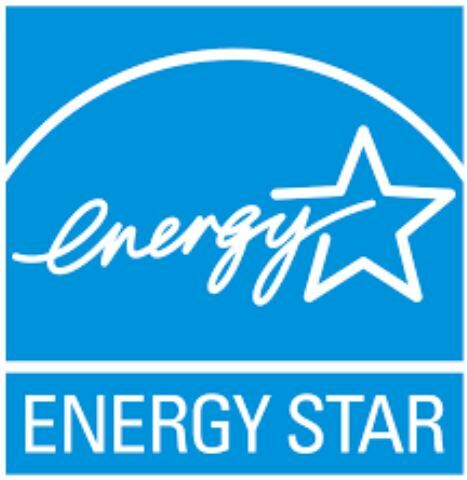 A product that meets those standards will display the Energy Star logo. Don’t trust a product label’s efficiency ratings unless you see the Energy Star logo. You’ve probably heard the story of Abraham Lincoln reading by candlelight when he was a child. Ironically, the electric light was invented nine years before Lincoln was born, but the bulb was impractical and there was no readily available source of electricity to run it. Contrary to popular belief, Thomas Edison did NOT invent the light bulb – he just improved the design, created the first electric grid, and did some aggressive marketing to sell both. Over a hundred years later, a variation of Edison’s incandescent bulb remains the standard. 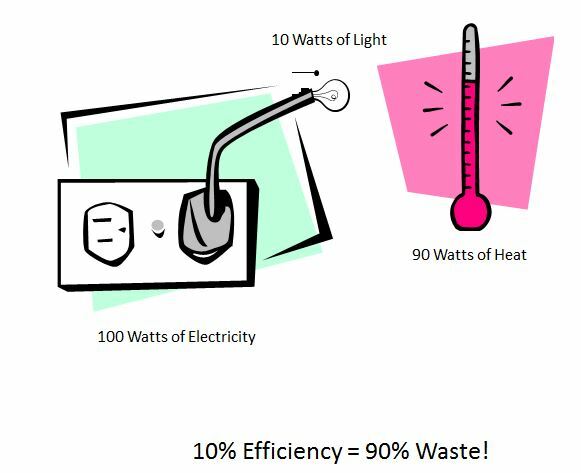 That’s a shame, because only 10% of the energy that goes into an incandescent light bulb is converted into light; 90% is wasted as heat. Fortunately we have better options today. Unless you need a heat lamp to keep your chickens warm, you really shouldn’t buy incandescent bulbs anymore. Compact fluorescent lights (CFLs) are four times more efficient than incandescents, but they produce a bad color spectrum, they take a while to warm up, and they have toxic mercury in them. At best, CFLs were a stop-gap solution to the inefficient lighting problem. Luckily, bulbs made from light-emitting diodes (LEDs) are now available. 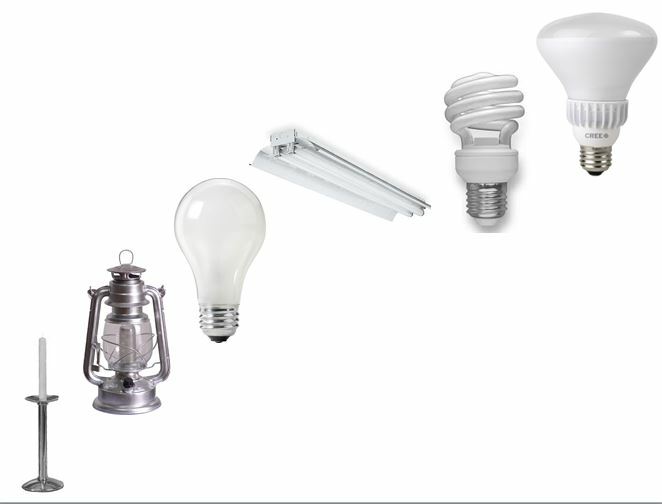 Compared to incandescents, LEDs are eight times more efficient and last forty times as long. LEDs produce a good color spectrum, they’re mercury-free, and they’re affordable. 75 watts x 6 hours/day = 450 watt-hours per day. 164 kwh/year x $0.12/kwh = almost $20 per year. That light will cost about $20 per year in electricity, and since incandescent bulbs only last about 1200 hours, you’ll be replacing it in around seven months. For about $2, you can replace that incandescent light with an LED bulb. 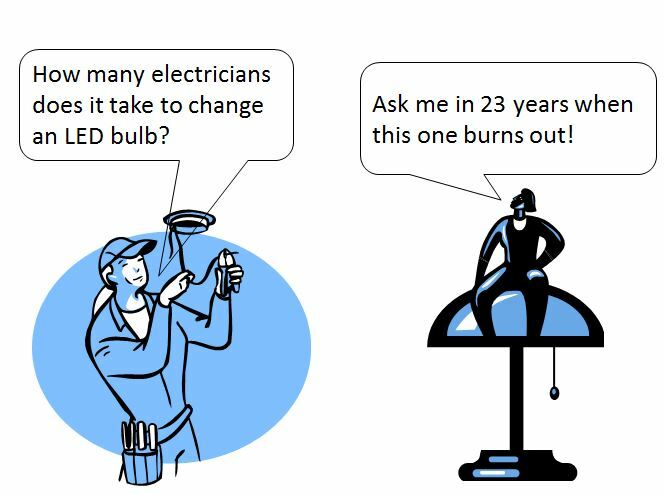 Running the same calculations, the LED will cost you less than $3 per year in electricity, and since LEDs last 50000 hours, you won’t have to replace it for 23 years. In less than two months you’ll have saved enough in electricity to pay for the initial cost of the LED bulb. That’s a quick payback period and a great return on investment! Do that for all of your light bulbs and the savings will multiply. Concerned about the safety of LED lighting? Here’s an article that addresses the issue. Electronic gadgets such as home entertainment centers use a lot of energy when they’re turned on. When they’re turned off, they still use a trickle of power while in “standby mode.” We sometimes refer to that as “vampire power” and overall it accounts for a very small amount of your electrical consumption. For example, a 42 inch LCD TV uses about 200 watts when turned on, but only one watt when turned off. If you left it plugged in but turned off for an entire year, it would cost about one dollar in electricity. It’s the same for cell phone chargers and most other appliances. Many older gadgets used much more power in standby mode, but over the past decade, engineers have designed products to minimize standby power consumption. If it makes you feel better, connect your home entertainment center to a power strip and turn off the power strip when it’s not in use. Do the same for your computer. Just be aware that you’re not going to save the environment – or a large sum of money – by doing that. If you’re in the market for a new television, plasma TVs are the biggest energy hogs; avoid them. In general, LED TVs use the least amount of energy, and LCD TVs are a close second. Check the Energy Star label to see the approximate annual electricity cost. Many years ago we bought a plasma TV. At the time, LCD TVs had just come out and their picture quality wasn’t very good. We kept the plasma for about eight years; last year we bought an LCD TV and I’m very happy with the improvement that they’ve made in the image quality. It’s better than the plasma. LED TVs are relatively new, but they also have excellent image quality. They are more expensive than LCDs, so the small decrease in energy usage might not make up for the price difference. Computers are becoming more efficient, and notebooks/laptops use about a third as much energy as desktop computers. Regardless of which you have, be sure to take advantage of its energy-saving features. Let the computer automatically go to sleep after a period of inactivity, and put it into hibernation when you won’t be using it for several hours. A desktop computer that’s on typically uses about 80 watts. In sleep mode that goes down to about 1 watt, and in hibernation it’s practically zero. And don’t bother running a “screen saver” program. Today’s screens don’t suffer from “burn in” so the screen saver is useless. It’s better to put the computer to sleep; that will automatically put the monitor into a low power standby mode. Large appliances use most of your electricity. Older appliances are very inefficient, so if you have anything that’s more than fifteen years old, you should seriously consider replacing it. Refrigerators and freezers that are more than ten years old should be replaced. Don’t just throw them away – they contain Freon, which is harmful to the environment. Many power companies will pick up your old fridge and properly recycle it. Our power company – Com Ed – even pays customers to recycle their old refrigerators. They pick up the fridge at no cost, recycle it, and give us $50 in credit on our next bill. When you buy a new fridge, look at the Energy Star label, which tells you the approximate cost of running the appliance for a year. Regardless of the model of refrigerator, there are ways to run your fridge more efficiently. A few times each year, vacuum the dust out from the coils. That helps it to remove heat so it uses less electricity. Keep the fridge full. The thermal mass of the food and beverages will help keep it cool inside. (Now you have an excuse to buy that extra case of beer.) When you open a fridge that’s mostly empty, the cool air comes out and is replaced by warm air from the room. That makes the fridge work harder to re-cool the inside. If nothing else, take a few old milk containers, fill them with water, and put them in the refrigerator. You can remove them if you need room for food and put them back as the food is used. The same is true for freezers. Dishwashers are kind of a paradox. Some people say dishwashers use less water than manually washing the dishes, while others argue that it depends on how you wash your dishes. One thing is certain: dishwashers use more energy than manually washing the dishes. If you use a dishwasher, be sure to skip the heat dry cycle. A typical dishwasher uses about 200 watts without the heat dry cycle, and that goes up to a whopping 1000 watts with the heat dry cycle. Instead of wasting all that energy, just open the dishwasher and let the dishes air dry. 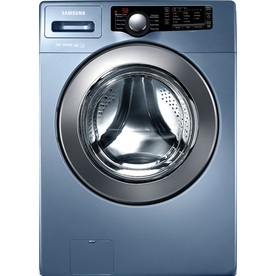 A front-loading washing machine uses less water and less energy than a top-loader. Front-loaders also have larger tubs, allowing you to do bigger loads. That saves even more energy. And to top it off, front-loaders do a better job of cleaning and their spin cycle removes more water, which means that your dryer will do less work. They are more expensive to buy than top-loaders, but they’ll pay for themselves in the long run. With that said, you can find energy efficient top-loaders as well – just look for the Energy Star logo. Well, that’s all for now. In my next article, I’ll discuss energy efficiency in your home’s heating and cooling systems. Do you have some energy saving tips to share? We have seen a big savings in the summertime with the A/C is on when we keep the ceiling fans on low. It keeps the air moving and the A/C does not come on as much. We use the LED bulbs and have both the washer and LED TV. But my freezer is over 10 years old. Might look into a new one. That’s good to hear, Michelle. Be sure to check with your power company to see if they offer a pick-up and recycling program for the freezer. In our home we have a swamp cooler instead of a air conditioner, and our electric bill goes down in the summer. Our dryer vent also was long and awful, the dryer would take double time to dry the clothes. Our solution was to put th dryer outside on the covered patio. It is working much better now, and in the winter we’ll move it inside and vent inside as well. I don’t like a clothes line for everything so this was our solution instead. Thanks for the input, Liz. Swamp coolers (also called evaporative coolers) are a good option for those who live in dry climates like the American southwest. In areas of high humidity, they don’t work so well. When I post part 2 of this article I’ll talk about heating and cooling, and I’ll mention a very inexpensive “personal evaporative cooler” that works in all climates. Stay tuned! You said that in the winter you vent the dryer indoors. I assume that you have an electric dryer. If so, that’s a good way to add humidity to your house in the winter. Humidity helps make the house feel warmer in the winter. But if you have a gas dryer, be sure to vent outdoors so you’re not breathing in the unburned gasses. There are some really important points you make! We have replaced a lot of our bulbs with the LED ones. Yes, they are more expensive, but they are cool and don’t heat up the room (especially the kitchen) like the old incandescent ones did. We will be buying a new fridge soon and in doing some research we found that the ones with ice through the door are the most inefficient, so we will be getting one without an icemaker altogether, simply because we will be off-the-grid and relying on our solar system. Of course, we will be drying all of our laundry on a line dryer also! I will be interested to see part 2 of this series. Have a great day! Thanks, Vickie. I’m glad you mentioned the ice maker – they do reduce the efficiency of a fridge. Also, side-by-side refrigerator/freezers are less efficient than the other kinds. In general, the fridge on top with freezer on the bottom is the most efficient kind. The important thing is to read the Energy Star label. Even within a particular style, there are certain models that are more efficient than others. Thanks, Rebecca. I’m glad you found it useful.